Each year, hundreds of thousands of seabirds, including many endangered albatrosses and petrels, are trapped and drowned in commercial fishing gear worldwide. Seabird avoidance measures developed and promoted by Washington Sea Grant (WSG) have been implemented in multiple fisheries, including Salish Sea gillnet, Alaska longline, west coast longline, South Africa pelagic longlines and multiple tuna commissions. 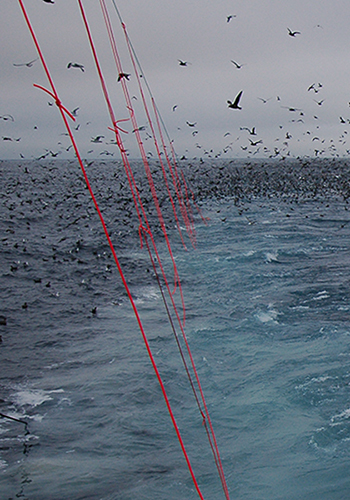 These measures include the use of streamer lines, a type of seabird avoidance technology that is deployed above the water behind longline and trawl vessels, thus creating a visual barrier that keeps seabirds away from the baited hooks or cables below. WSG has helped to prove that streamer lines work. Some members of the fishing industry voluntarily adopted streamer lines in 2002, and then the North Pacific Fisheries Management Council began to require their use in 2004. Since that time, Alaskan fisheries have seen a 90 percent reduction in albatross bycatch rates and a 77 percent reduction in the bycatch rates of other seabirds. Over the years, in addition to their work in Alaska, WSG and partners have tested and refined prevention measures in the West Coast longline sablefish fishery, the Washington State salmon drift gillnet fishery, the Bering Sea pollock trawl fishery and the southern hemisphere pelagic longline fisheries for tuna and tuna-like fishes. WSG Marine Fisheries Scientist Ed Melvin and his colleagues won the 2015 Presidential migratory Bird Federal Stewardship Award for their work implementing the seabird bycatch program along the West Coast and for their outstanding achievements in bird conservation. WSG shares the 2015 Presidential Award with collaborating fishermen and industry associations, NOAA’s West Coast Region and Northwest Fisheries Science Center, Oregon State University, California Sea Grant, Oregon Sea Grant, the Makah and the Quinault and Quileute tribes. Learn more about WSG’s seabird bycatch from the collection of summary publications below. For publications on the seabird bycatch issue as it is related to specific types of fisheries, please see the pages for longlines, trawlers and gillnets. Melvin E (2013) Criteria for best practice seabird bycatch mitigation. SBWG-5 Doc 32, Fifth Meeting of the Seabird Bycatch Working Group, Agreement on the Conservation of Albatrosses and Petrels, La Rochelle, France, 1-3 May 2013. Melvin EF, Parrish JK (2003) Focusing and testing fisher know-how to solve conservation problems: a common sense approach. In Haggan N, Brignall C, Wood L (eds) Putting Fishers’ Knowledge to Work: Conference Proceedings. University of British Columbia, Vancouver, Fisheries Centre Research Report, Vol. 11, pp. 224-226. Melvin EF, Parrish JK (2001) Preface. In Melvin EF, Parrish JK (eds), Seabird Bycatch: Trends, Roadblocks and Solutions. University of Alaska Sea Grant, Fairbanks, AK, pp. v-vii. Melvin EF, Parrish JK, editors (2001) Seabird Bycatch: Trends, Roadblocks and Solutions. AK-SG-01-01. University of Alaska Sea Grant, Fairbanks, AK. Melvin EF, Parrish JK (2001) Symposium synthesis. In Melvin EF, Parrish JK (eds), Seabird Bycatch: Trends, Roadblocks and Solutions. University of Alaska Sea Grant, Fairbanks, AK, pp. 1-7. Melvin EF, Robertson G (2000) Appendix 3: Seabird mitigation research in longline fisheries: status and priorities for future research and actions. In Cooper J (ed), Albatross and petrel mortality from longline fishing, International Workshop, Honolulu, HI, 11-12 May 2000. Marine Ornithology28:178-181. Norris S, Hall M, Melvin E, Parrish J (2002) Thinking like an ocean: ecological lessons from marine bycatch. Conservation in Practice 3:4-12.